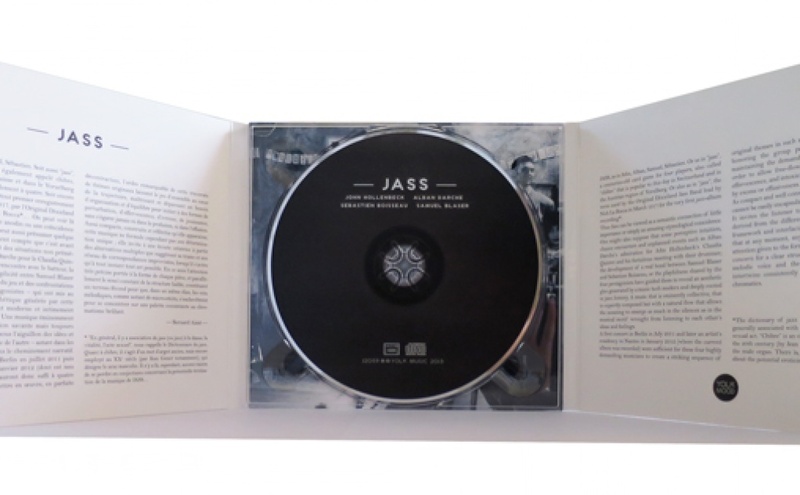 Thus Jass can be viewed as a semantic connection of little importance or simply an amusing etymological coincidence. One might also suppose that some perceptive intuition, chance encounters and unplanned events such as Alban Darche’s admiration for John Hollenbeck’s Claudia Quintet and his fortuitious meeting with their drummer, the development of a real bond between Samuel Blaser and Sebastien Boisseau or the playfulness shared by the four protagonists have guided them to reveal an aesthetic glee generated by a music both modern and deeply rooted in jazz history. A music that is eminently collective, that is expertly composed but yet its natural flow allows the meaning to emerge as much in the silences as in the musical motif wrought from listening to each other’s ideas and feelings. A first concert in Berlin in July 2011 and later, an artist's residency in Nantes in January 2012 (where the current album was recorded ) were sufficient for these four highly demanding musicians to create, in such a natural fashion, a striking sequence of original themes whilst maintaining the group performance at its heart, whilst keeping in check demands of organisation and balance in order to allow free-flowing elements of interference, of effervescence, of intoxication and yet avoiding being side-tracked on an excess or effusiveness. As compact and well-constructed as it appears, this music cannot be easily encapsulated by one single interpretation. It invites the listener to create one’s own impression derived from the different alternatives suggested by it’s framework and networked connections which suggest that at any moment anything is possible. The precise attention given to the form of each piece and the constant concern for a clear structure are a fertile basis for the melodic voice and the many micro-narratives which intertwine consistently on a palette of incandescent chromatics. 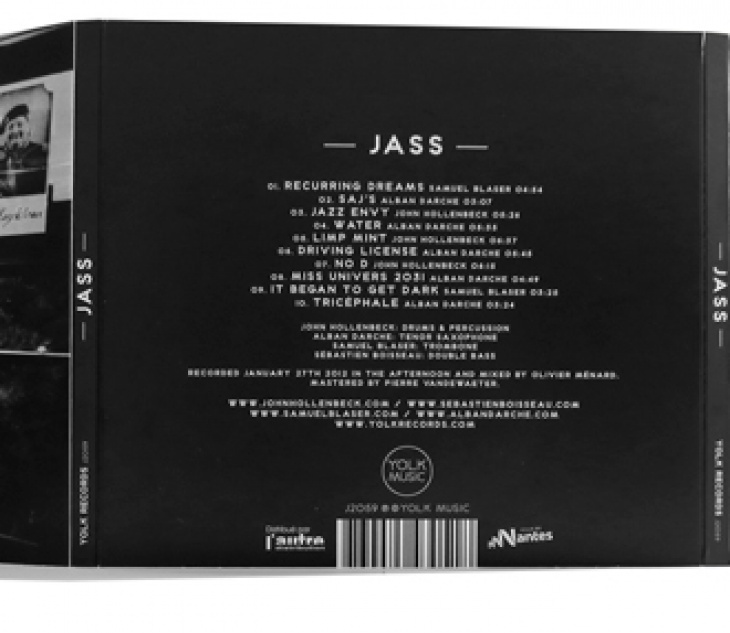 *The dictionnary of jazz informs us that jass (or jazz) is generally associated with dance, with vitality and with the sexual act. “Chibre” is an old slang word though still used in the 20th century (by Jean Genet for example) that refers to the male organ, There is, however, no reason to speculate about the potential eroticism of the music created by JASS ! "A new ensemble called J.A.S.S. : the "J" of drummer John Hollenbeck, the "A" of saxophonist Alban Darche, the "S" of trombonist Samuel Blaser and the "S" of bassist Sébastian Boisseau. The group's music was full of references to musical mastermind Steve Coleman, rich of color and grounded inner grooves. Boisseau often played his bass like a guimbri in Gnawa music, while Hollenbeck used the space to intermingle airy Brazilian percussion. The two horns were powerful and sophisticated, but also funny, and never overstated. It was the intelligent tripping of a group with its very own signature, which still has more of it in the can." olh acoustic >> G. meets K.
alban darche trio >> brut ou demi sec?